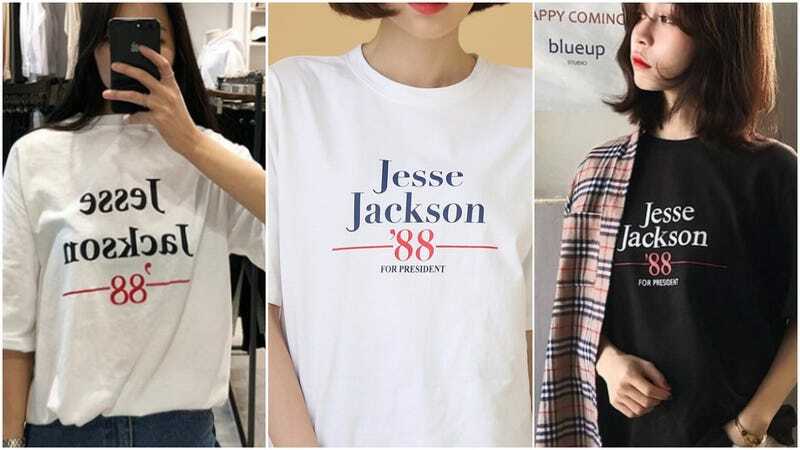 Jesse Jackson might have lost his 1988 bid, but his campaign lives on in South Korea as youth fashion. Earlier this year, Jesse Jackson themed threads started appearing in South Korea. W. David Marx, author of the excellent Ametora, recently pointed out the trend. The shirts come in a surprising variety. You know, for Jesse Jackson 1988 campaign tees. Jesse Jackson is, of course, known in South Korea. Some even tagged their images with 제시잭슨, which is the civil rights activist and presidential candidate’s name written in Korean. People are supposedly wearing them, too! A number of retailers appear to carry them. In the past year or so, Jackson has become increasingly involved with and interested in Korean politics. Last month he met with South Korean president Moon Jae-in. That, combined with feelings of 1980s nostalgia plus pure Americana might explain the shirts.